The purpose of the Willingboro Local History Collection is to preserve materials that document the history of Willingboro, and to make these materials available to researchers, exhibition and the general public. The library holds these materials in trust for future generations, and therefore, for preservation reasons, materials can only be used in the library. The major emphasis of the collection is historical and current information about the township of Willingboro. Subject areas include: early settlers, recent immigrants, ethnic groups, family, business, work, and prominent individuals and events. Materials on these subjects will not be declined based solely on language. The Collection houses materials in a variety of formats including, but not limited to: books, pamphlets, manuscripts, posters, diaries, letters, maps, business records, minutes, reports, photographs, scrapbooks, and personal papers. The Library actively seeks to procure materials, and also depends on generous donations from the public. We will promote our procurement efforts through Township and Library publications. The Library Director must approve purchases over $500.00. 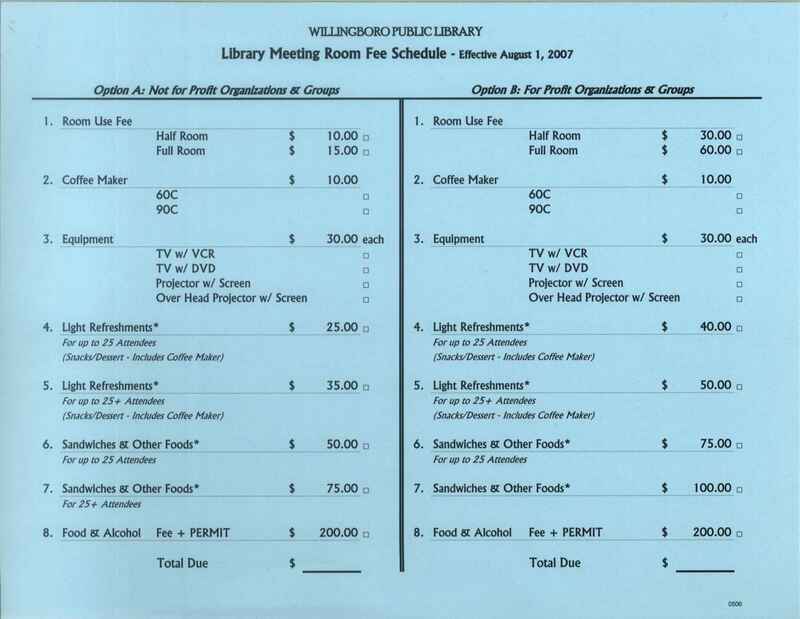 Donations will be accepted provided that (a) there is a signed Deed of Gift form that legally transfers ownership of the materials to the Willingboro Public Library, and (b) the donor does not require excessive restrictions on use. Items will not be accepted on deposit except by separate signed agreement that is approved by the Library Director. The only exception is the temporary loan of items for exhibition. Under special circumstances, items from the Willingboro Public Library will be loaned to other institutions for exhibition. Donation will be accepted only if the Library believes it can make good use of the material. In cases where the collection would fit better in a different institution, the Library will work with the donor to place it elsewhere. For example, the Library is not interested in collecting artifacts. If such items are made known to us, we may work with the donor to place the items with the state museum. The Library Director and the local history archive librarians will make value judgments as to what the Library accepts. The judgments will be based on how the material fits with our existing collection, who made the record, what kind of information the record offers, what the potential use and limitations of the collection might be, and whether the library will be able to conserve, preserve, and make the collection accessible. The Library's decisions are not intended to offend the donors or to suggest that their collections have no value. The Library will urge donors to hold on to materials it rejects or search for a better institution to house them. The library will not do monetary appraisals for donors. Willingboro Public Library reserves the right to dispose of materials inappropriate to our collections. Options include returning materials to donors, selling items, and offering collections to other institutions. Occasionally, Willingboro Public Library shall enter into cooperative arrangements with other organizations in order to preserve historical materials and/or make them more widely available. Local history materials will be cataloged following generally recommended guidelines. The collection will be made available to historians, writers, scholars, genealogists, and members of the general public who are engaged in serious research or just interested in viewing the collection. Every researcher will be required to fill out a search record form that will be used to document the types of material being used, and contact patrons if additional information is found on their research subjects. Tour of the Collection can be arranged by appointment or as part of the general tour of the Library. Patrons will not be directly allowed into the local history room, except when they are accompanied by library staff; patrons would have to make their request of local history material known at the Reference Desk. Patrons will be required to view materials in a designated research area. Loose-leaf paper and soft lead pencils are the only items allowed in the research area when archival materials are being viewed. Patrons should expect more staff supervision for archive use than for general library use for both security and preservation reasons. Materials approved for exhibit in the Local History Room will be limited to items with historical, educational, and artistic values to the community. Exhibits in the Local History Room will typically be for a long duration (e.g. six months minimum) and shall feature pieces in the Library's collection as well as items loaned to it. From time to time, and subject to the approval of the Library Director, there will be temporary exhibits and displays of 90 days or less. From time to time, Willingboro Public Library will reappraise the collection. At these times, deaccession of some materials will take place. The Library will exercise the option of offering deaccessed materials to more appropriate institutions or returning them to the donor, depending on the requirements in the donor's deed of gift. These materials should be derived from, or have ties with, Willingboro Township. If you have any questions about whether we are interested in what you have, please feel free to contact us.